UPPSC Officers And Others Post Result Check Here. UPPSC Officers And Others Post Admit Card 2018. UPPSC Notification is out. UPPSC is recruiting for 1105 Officers And Others Post Posts. You can check UPPSC - Uttar Pradesh Public Service Commission last date, download UPPSC notification, visit UPPSC official website and check other UPPSC Vacancy details.Complete Vacancy and recruitment Details about 1105 Officers And Others Post vacancies in UPPSC are provided below by JobSarkari.Com only for you. Last Date For Apply Online. 14/06/2018. Last Date of Pay Exam Fee. 14/06/2018. Last Date of Complete Form. 18/06/2018. Last Date For Receipt Hard Copy. 25/06/2018. Mode of Payment. Candidate Can Pay Through Online Banking Or Credit And Debit Card Or Through E- Challan. S-01/01 Assistant Radio Officer. Candidate Must Have Passed Engineering Degree in Electronics/ Electronics And TeleCommunication/ Electrical Engineering. Min 21 and Max 27 Years. 12. S-01/02. Director. Candidate Having Master's Degree in Science And Having 15 Years of Experience in Related Field. Min 40 and Max 57 Years. 01. S-03/05. Assistant Director (General Performing Art). Candidate must Have Passed Graduation and Having 5 Years of Experience. Min 21 and Max 40 Years. 02. S-03/06. Assistant Director (Law). Candidate having Bachelor degree in Law (LLB) With 55% Marks and 5 Years of Experience. Min 21 And Max 40 Years. 01. S-03/07. Assistant Archaeological Officer. Candidate Having Master Degree in History, Culture and Archaeology or in Indian Medieval History and 2 Years of Experience. Min 25 And Max 40 Years. 02. S-03/08. Assistant Director Art Ware. Candidate Having Master Degree in History And 2 Years Experience. Min 21 and Max 40 Years. 01. S-03/09. Sangrahalayadhyaksha. Candidate Must Have Passed Master Degree in Ancient Indian History and Archaelogy or Culture and 2 Years Experience. Min 21 And Max 40 Years. 02. S-08/70. Drug Inspector. Candidate Must Have Passed Degree in Pharmacy or Pharmaceutical Sciences. Min 21 And Max 65 Years. 11. S-08/71. Professor Pathology. Candidate Having Ms Degree As Mentioned in Notification. Min 21 And Max 65 Years. 01. S-08/72. Professor community Medicine. Candidate Having Ms Degree As Mentioned in Notification. Min 21 And Max 65 Years. 01. S-08/73. Professor General Medicine. Candidate Having Ms Degree As Mentioned in Notification. Min 21 And Max 65 Years. 01. S-08/74. Professor Paediatrics Candidate Having Ms Degree As Mentioned in Notification. Min 21 And Max 65 Years. 02. S-08/75. Professor Orthopaedics. Candidate Having Ms Degree As Mentioned in Notification. Min 21 And Max 65 Years. 01. S-08/76. Professor Obs and Gyane. Candidate Having Ms Degree As Mentioned in Notification. Min 21 And Max 65 Years. 02. S-08/77. Professor Anesthesiology. Candidate Having Ms Degree As Mentioned in Notification. Min 21 And Max 65 Years. 01. S-09/01. Assistant Directors. Candidate having Bachelor Degree in Science with Biology, Chemistry or Agriculture and Having 2 Years Experience. Min 21 And Max 40 Years. 03. S-09/02. Technical Officer/Principal Grade II/ Vice Principal. Candidate Having Engineering Degree Mechanical, Electrical, Electronics, Telecommunication Automobile or Production Engineering and 2 Years of Experience. Min 21 And Max 40 Years. 02. S-09/03. Medical Officer. Candidate Must Have Passed MBBS Degree and Registration in Council. Min 21 And Max 40 Years. 05. S-11/01. Medical Officer. Candidate Having Degree in Homeopathy and Registration in Council. Min 21 And Max 40 Years. 494. S-11/02. Lecturer Kulliyat. Candidate Must Have Passed Unani Degree and Master Degree and Having Knowledge of English, Hindi and Urdu/Arabic/Persian As Mentioned in Notification. Min 25 And Max 40 Years. 01. S-11/03. Lecturer Ilaj bit Tadbeer. Candidate Must Have Passed Unani Degree and Master Degree and Having Knowledge of English, Hindi and Urdu/Arabic/Persian As Mentioned in Notification. Min 25 And Max 40 Years. 03. S-11/04. Lecturer Tahafuzzi wa Samaji Tib. Candidate Must Have Passed Unani Degree and Master Degree and Having Knowledge of English, Hindi and Urdu/Arabic/Persian As Mentioned in Notification. Min 25 And Max 40 Years. 01. S-11/05. Lecturer Ilmul Atfal. Candidate Must Have Passed Unani Degree and Master Degree and Having Knowledge of English, Hindi and Urdu/Arabic/Persian As Mentioned in Notification. Min 25 And Max 40 Years. 01. S-11/06. Medical Officer. Candidate Having Degree and Diploma in Ayurveda and Having 6 Months Experience. Min 21 And Max 40 Years. 544. S-03/05. Assistant Coach (Football). Candidate Must Have Passed Bachelor Degree and Diploma in Training in The Related Game and Having 2 Years of Experience As Mentioned in Notification. Min 21 And Max 40 Years. 01. S-03/06. Assistant Coach (Law Tennis). Candidate Must Have Passed Bachelor Degree and Diploma in Training in The Related Game and Having 2 Years of Experience As Mentioned in Notification. Min 21 And Max 40 Years. 01. S-03/07. Assistant Coach (Table Tennis). Candidate Must Have Passed Bachelor Degree and Diploma in Training in The Related Game and Having 2 Years of Experience As Mentioned in Notification. Min 21 And Max 40 Years. 01. S-03/08. Assistant Coach (Weigh Lifting). Candidate Must Have Passed Bachelor Degree and Diploma in Training in The Related Game and Having 2 Years of Experience As Mentioned in Notification. Min 21 And Max 40 Years. 01. S-03/09. Assistant Coach (Cricket). Candidate Must Have Passed Bachelor Degree and Diploma in Training in The Related Game and Having 2 Years of Experience As Mentioned in Notification. Min 21 And Max 40 Years. 01. S-03/10. Sports Officer. (Volleyball). Candidate Must Have Passed Bachelor Degree and Diploma in Training in The Related Game and Having 2 Years of Experience As Mentioned in Notification. Min 21 And Max 40 Years. 01. S-03/11. Sports Officer (Lawn Tennis). Candidate Must Have Passed Bachelor Degree and Diploma in Training in The Related Game and Having 2 Years of Experience As Mentioned in Notification. Min 21 And Max 40 Years. 01. S-03/12. Sports Officer (Gymnastic). Candidate Must Have Passed Bachelor Degree and Diploma in Training in The Related Game and Having 2 Years of Experience As Mentioned in Notification. Min 21 And Max 40 Years. 01. S-03/13. Sports Officer (Swimming). Candidate Must Have Passed Bachelor Degree and Diploma in Training in The Related Game and Having 2 Years of Experience As Mentioned in Notification. Min 21 And Max 40 Years. 01. S-03/14. Sports Officer (Basketball). Candidate Must Have Passed Bachelor Degree and Diploma in Training in The Related Game and Having 2 Years of Experience As Mentioned in Notification. Min 21 And Max 40 Years. 01. Q. What is the Last Date For UPPSC Officers And Others Post Vacancy ? A. 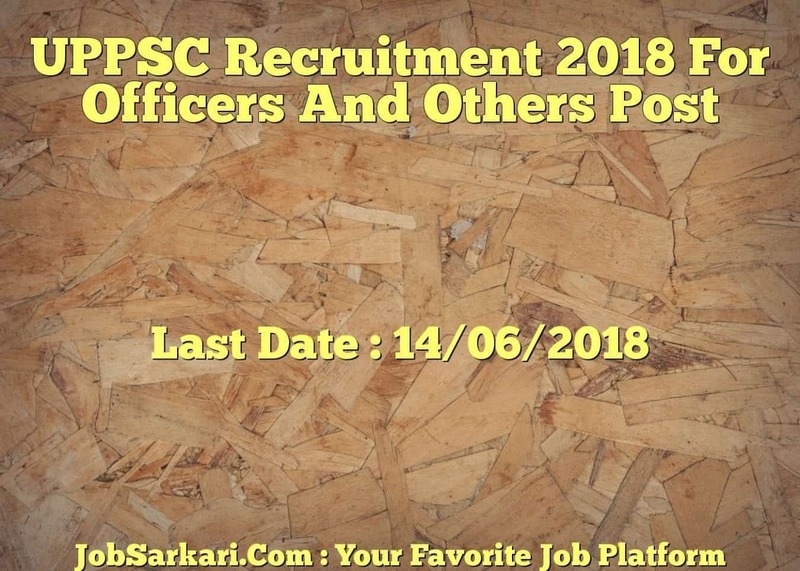 Last Date for UPPSC Officers And Others Post Posts is 14/06/2018. Q. What is the Form Type of UPPSC Officers And Others Post Recruitment ? A. The Form Type for UPPSC Officers And Others Post Posts is Offline, Online. Q. How many vacancies are available in Uttar Pradesh Public Service Commission Officers And Others Post Posts ? A. There are about 1000 Vacancies in Uttar Pradesh Public Service Commission Officers And Others Post Posts.